The fall season's first large storm system is providing an abrupt wake-up call to residents of the Twin Cities who've basked in unusual late September/early October warmth. Minnesota Forecaster talked with Tom Novak from @NovakWeather to learn more about what we can expect as the long-duration system sets up shop. I haven't posted in a while so I figured I would go ahead and chime in on this one. This storm system, as mentioned in the video, has all the makings of a big severe weather event across IA, MN, WI, and IL. The models are still somewhat at odds with the 00z runs, especially with where they are placing the surface low and its associated fronts. NAM is most aggressive with the northerly push of the warm front where the others are set up further south. Many forecasters aren't buying into the NAM's solution so they are mostly discounting it. Shear and overall dynamics will certainly be in place for this one, but instability will be important for the initiation of the cells across IA and southern MN. If those areas don't see sunshine and instability doesn't build, then the storm cells will likely shear themselves out and be mostly general to strong thunderstorms. If those areas do see sun and the energy builds, then it will probably end up being the biggest outbreak of the year for MN. The SPC's forecast seems ok IMO, but it does seem like the models are starting to shift that warm front further north, which would put more areas in the higher hatched area. If the 12z model runs continue to show this bump north, then the SPC will have to have their higher risks expanded. A moderate risk is probably going to come from this, which they hinted at in their discussion. Either way quite a bit of rain is on the way for a good chunk of MN and WI. Stay safe everyone! Lots can still change so it's important to stay up to date with forecasts especially since this is a Friday night event and high school football will be going on. Both the GFS and Nam from the 04/0z runs show a strong easterly component with the surface wind fields, this wind field originates NE of the great lakes and pours over MN. Believe it or not this marine layer will effectively cut off the surface based cape at the MN/IA border and greatly reduce the tornadic activity in MN if not eliminate it all together. The one area to be watched is the I90 corridor. Beyond that the Nam seems to recover around 7pm and brings elevated cape and storms as far north as the metro with damaging winds and hail as the greatest threat. Yet on the other hand the GFS basically ends the severe threat for the metro. I currently believe the GFS over the NAM as history has proved that a strong easterly component is hard to over come. Please stay tuned to your favorite pro weather outlet for further updates. Just my amateur guess...but I think the Moderate Severe threat may be dropped all together. A couple of great posts above. I agree with Randy on the strong easterly winds suppressing the greatest energy south near the MN/IA border. Near the I-90 corridor & in no. IA is where I expect storm imitation Friday PM. It is in those first few hours of initiation, say 4pm-8pm, when tornadoes will be most favorable. After that, the storms will surge north towards the MSP metro and will likely become wind/hail producers. This should an interesting situation that will be fascinating to watch unfold. Based on the 00z data, I agree with the above stuff. It seems as though the warm front will get hung up in northern IA before eventually advancing north overnight Friday into Saturday. I believe if I was going out to spot and chase these generally an area between Sioux City, IA and Sioux Falls, SD would be good starting spots. I also believe that the moderate risk will be shifted south and west a bit but could still edge into southern/southwestern MN. I could also see the northern extent of the slight risk be edged south as well given the slower movement of the front. This still looks like a good heavy rain producer though and given the overall dynamics of this storm system, storms may remain severe well after dark. I agree that it will be pretty interesting to watch this unfold. Anyway, here's how I think the 7pm surface maps will look for Friday. I believe the triple point will set itself up somewhere in the vicinity of Sioux City, IA with storms firing in the warm sector along the cold front and across the warm front. Duane: Nice job with your target area, the reports seem to match the area you were looking at. I agreed with that when I saw it last night, just couldn't respond as I had to get to bed before an 11 hour day. Not sure if this was a true marine layer or not, but none the less it cut us off from severe weather. In my opinion, this seemed to be a storm that was pretty well nailed down, at least the winter part of it. As for the severe weather, it shifted a bit to the south, otherwise this storm was predicted pretty good. I thought Wednesday night's precip over performed and that last night's underperformed. I'm considering only precip amounts as severe weather is harder to predict. As of Saturday morning, I believe we've totaled about 1.3 inches of rain through the event. I saw many forecasts of 2-4 inches of rain. Thanks Randy. We can thank a slower and further west moving system for the general bust in rain totals. There were some areas, however, in SE MN and SW WI that saw a lot of rain last night. That area of storms looked to be driven by the warm front that has been slowly lifting north through the night and day today. Minnesota honestly lucked out as far as the severe aspect goes. Keep in mind that models has the low going much closer to the Twin Cities initially. That would have spelled major trouble as there were some pretty large tornadoes in IA and NE yesterday. Not sure exactly how much rain we saw here, but it was generally in that 1-2 inch range I believe. Starting to get to my time of the year.......very "interesting" read in this afternoons area discussion at the NWS.....is snow in the offering next week? Bill looks like a new post might be warranted with a cut and paste of the NWS area discussion. big daddy...I'm not buying into this yet, the models have been very inconsistent with respect to the amount of cold air available with this system when we get on the back side of it. Having said that, we seem to be in a highly amplified pattern and if that should continue through the end of Oct. to early Nov. we could be in for a decent snowfall, possibly plowable. Because of that my current plan is to fire up the snow thrower this Sunday just to make sure it's ready to go. I'm with you Randy......I need to work on my snowblower as well, shear pin broke during the last snowfall of spring.I sense there is something around the corner(like before the months up)with regards to snow.NWS has mentioned that possibility for. a discussions now anout snow,even mentioning that the euro brings in cold enough air at the end of next week to support snow. We'll see what happens. 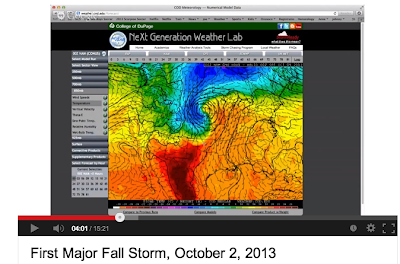 I went back and looked at Paul Huttner's column on 9/25/2013, which had the GFS predicting a Friday morning low of 27. Turned out to be 57. Hey, only 30 degrees off. It did a little better with the high temp, which was 75. It predicted 51. There is something criminally wrong with that model. The GFS is very unreliable when it comes to temperatures......those numbers they spit out daily change wildy(I believe that Accuweather uses their data because their numbers vhange drastically as well). Now onto other weather matters......NWS is still harping on the possibility of some kind of snowfall towards the end of next week.....they mention in their discussion this morning that the euro solution paints snow from Iowa into southern WI a week crom tommorrow and reference the trend of the euro last winter was for storms to move further north with time....so of course they use the word "interesting" again for the 7-10 day outlook.....like I say time will tell, but PWL it will help if you start your bring it chants! Good article on upcoming winter at theweathercentre.blogspot.com... for any who are interested to see it. @Bemaki thanks for sharing that link, it was a good read and I hope it pans out that we have a cold and snowy winter. PWL.....there is 'some' snow mentioned this weekend,just snow showers nothing significant but it just means winter cant be too far behind. I love the 4 seasons (seems like only 2 or 3 seasons the last couple years) MN has to "offer" however, I am (was) loving the wonderful fall this year. Really not looking forward to snow or cold but I do love the shovel bending, school closing, metrodome roof collapsing snow events we get from time to time. All taken in fun. In truth, I have always loved snowstorms and I always will, but I hate the cold. Hard to have one without the other. But we have all learned that we can't beat the weather, so I join it. If snow is coming--whenever snow is coming--I literally can hardly sleep on the verge of a big snow storm! As much as I wanted spring last spring, I LOVED the large snowstorms of April and May. Either way, bring the snow and keep the cold!! And, I love this blog. This is one of the few places that adds very good details from very good bloggers about upcoming storms. Keep it going as this can be by "snow lifeline!" Hey Bill......did you catch Dave Dahl's "snowometer" for the upcoming winter on tonights broadcast?......he is calling for way above average snowfall of 75 inches. He also has snow showers in his forecast for this Saturday night and also stated theres a better chance for snow next Tuesday. Time will tell, but like the fact snow is getting mentioned. @bigdaddy, Paul Huttner's blog at MPR this evening claims theres a shot at measurable snowfall next Tuesday as well and says the 'maps are looking increasingly wintery for late October". I guess its time to winterize the outside of my house this weekend, this is coming on way too quick! Just over 8 short weeks until we start heading back towards summer! ECMWF HAS 3-6" WITH MUCH HIGHER TOTALS ACROSS NORTHERN MN. Knowing the GFS, I am guessing the Euro is the more accurate of the two predicitons. To even think we could get inches of snow in October after being in the 70's for a week just a week ago is pretty amazing. What has me excited is the numerous snow mentions in the grids at NWS from the weekend thru early next week. Bill.......any chance a video with Dr.Novak on the possibility of October snow in the near future? @Bigdaddy, The good doctor Novak is out of town and also feels there's not enough to go on at this point, anyway. I'm sure if things look truly interesting, he'll get involved. The Euro is saying 50s return by Sunday 10/27. Huttner's pal the GFS is putting us in sub-freezing temps for Halloween evening. Can't wait to look back and laugh. I hope! Huttner's generally decent but every post as to be named some combination of months, like Octember, etc. Enough of that! Get original! Quite the sleet shower that rolled thru early this afternoon here in Golden Valley, you can check off the first winter precip sighting off the list for the fall/winter.......looks like the first snowflakes could be overnight tonight and definitely the first frost/freeze for the metro coming this week with a stretch of 3-4 nights below 32 showing up on the models. I know I have mentioned this before, but what irritates me is when were quick to disregard a certain model and what its depicting, for example in yesterday's NWS discussion they claimed they were disregarding the NAM model because it was too far south with the placement of the low pressure for tonight/Sunday's little rain/snow event, now in this afternoons discussion they are saying " kudos to the NAM model for being the trend-setter" for the further south placement on all the other models which brings more precip into the metro area and as a result a longer duration of snowfall. Thats why I say never disregard what a model is depicting because in the end that can be the right model no matter how they have performed in the past.....in regards to this little clipper moving thru tommorrow I wouldnt be at all surprised that a little more snow falls further south then depicted currently, which calls for the heaviest snow to fall north of I-94.